When you enter the Museum of Fine Arts from Huntington Avenue you could easily walk right by a room full of rarities. Plenty of people are surprised to learn about their existence. "I always hear, 'Wow, they have musical instruments here,' " Bobby Giglio said as we began talking about the somewhat hidden trove. 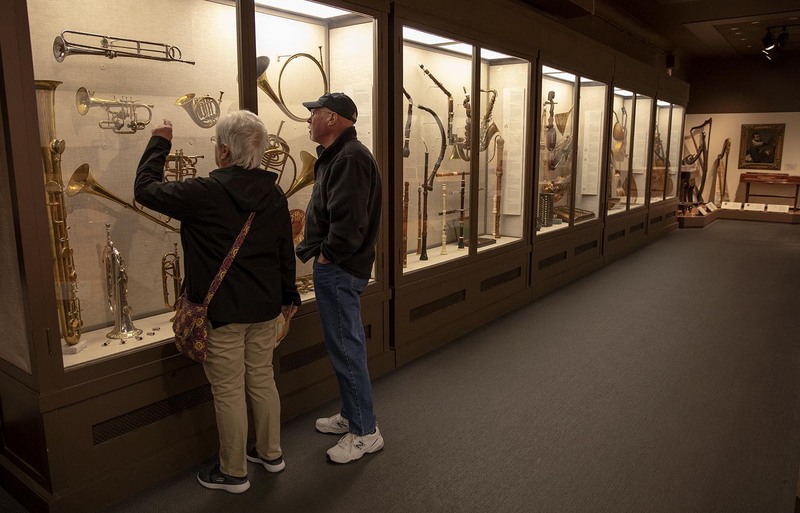 He’s the museum's instruments department coordinator and wants more visitors to discover this room and the museum's eclectic, more than 1,200-piece collection that spans the ages. 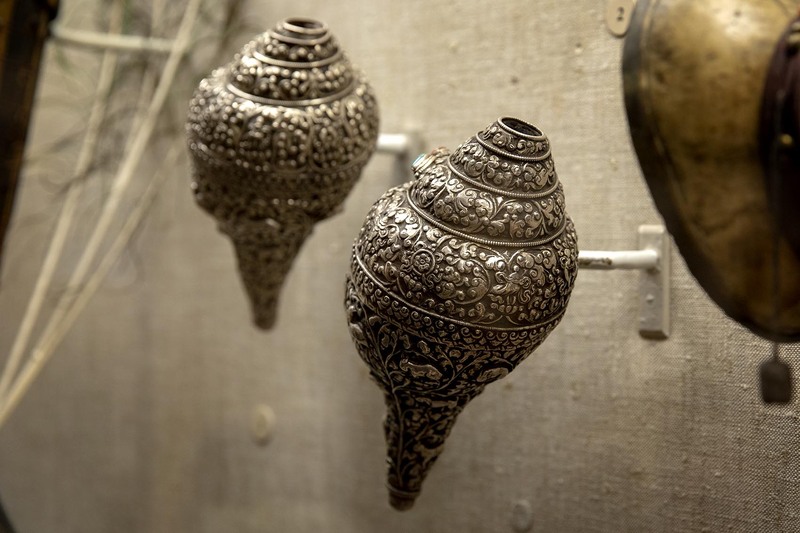 There’s a stunning, stone-and-silver-encased shell trumpet, likely from Tibet. And a really cool, French-made glass flute from 1837. Also an African lamellophone (aka mbira) played by thumbing metal prongs attached to a stout, wooden body. It’s in a case paces away from a vibrant Glenwood 99 electric guitar — circa 1964 — dressed in robin’s egg blue. Mid-gallery, among a group of historic keyboards, stands an intricately carved and painted harpsichord made in Paris in 1736. It’s still playable, and Giglio calls it a flagship. To that end, the instrument department has been experimenting with perception-changing strategies, including an event this week called “Art in Tune.” It’s designed to engage visitors with rare pieces that usually sit safe and silent behind ropes and glass. Beginning at 6 p.m. on Thursday, more than 20 musicians will bring historic and modern artworks to life at 11 different locations throughout the museum. The grand staircase will become a stage for a duet played on early horns. The contemporary art wing will serve as a venue for a recently acquired quintet of electric string instruments crafted just this year. 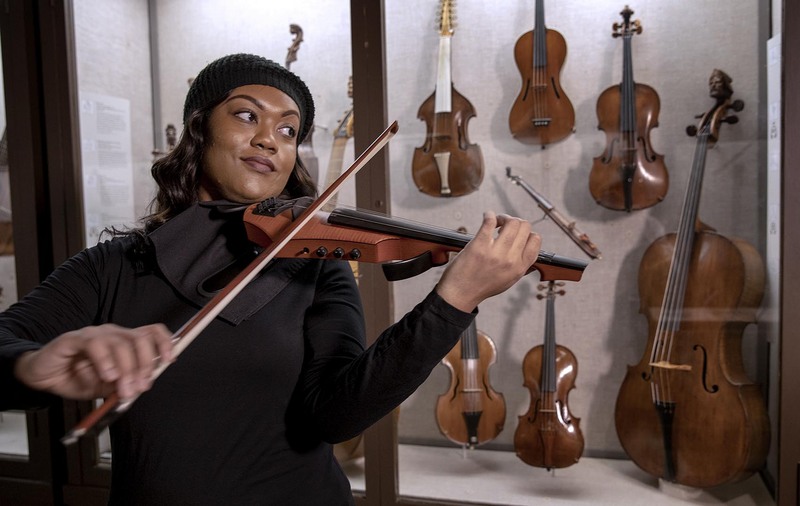 Berklee College of Music associate strings professor Chelsey Green will have the chance to play the NS Electric Viola made by the award-winning instrument designer Ned Steinberger. In the music room, she demonstrated the instrument’s sound for me. Her nimble fingers danced across the electric viola's narrow neck and sleek, auburn-colored body powered by an amplifier. Her excitement was infectious as she compared the experience to playing a traditional viola. “It gives you different colors, different timbres, different tones that can create different ideas,” the musician explained. Green illustrated the futuristic-looking instrument’s sound with her re-arrangement of jazz saxophonist John Coltrane's “My Favorite Things.” She was flanked by glass cases holding centuries-old Italian strings by Stradivarius, Guarneri and Amati. There are also ceremonial fiddles and harps from various regions in India and Africa. 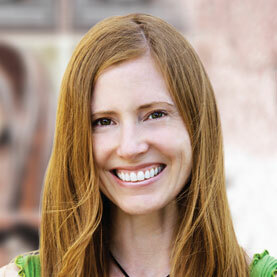 For her it was a little like being a kid in a candy shop — without any money. “I mean I just want to just get [an instrument] out and let's make it a play time,” she said, laughing. Green was curious about what the MFA’s 19th-century Ugandan ndongo would sound like. It’s made with goat hair and sea shells. Its round body is covered in stretched lizard skin. 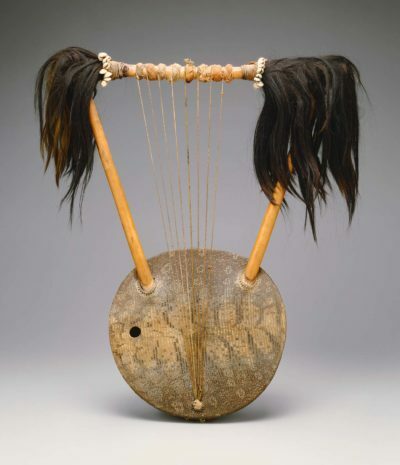 The museum has a recording of a modern ndongo, but the collection’s delicate instrument — traditionally used for storytelling — is not on Thursday's “Art in Tune” bill. Giglio explained that the featured instruments had to be chosen very carefully. Giglio and Darcy Kuronen, the museum's musical instruments curator, have been assessing the collection — piece by piece — to determine what’s playable and what’s not. They’ve been posting videos on YouTube of functioning pieces, including this tenor trombone with a snake head for a bell that Giglio says always sparks a question. The MFA has also been testing out pop-up performances to bring the music room’s other playable instruments to life. 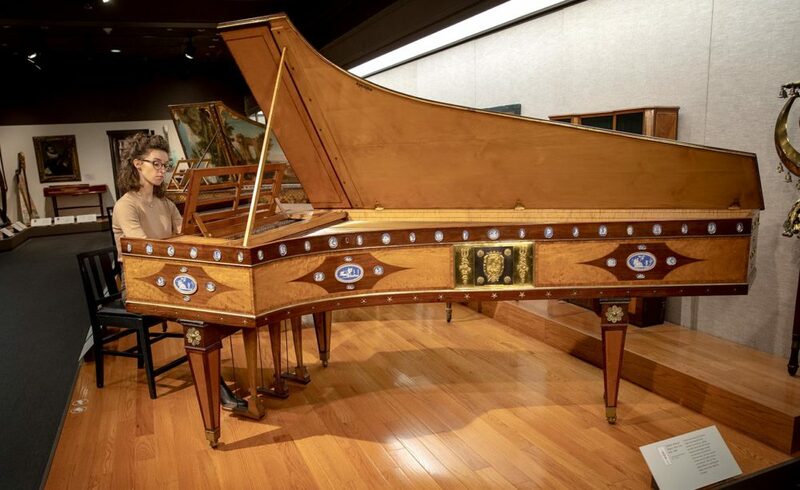 Martina Wlodarczyk, a specialist in playing historic keyboard instruments, has been volunteering at the MFA to activate an English 18th-century Broadwood grand piano commissioned for a prime minister of Spain. “When I enter a room like this, and I see all these keyboard instruments that are a few hundred years old and they are still playable, that are maintained perfectly, it's like heaven to me,” she said with her fingers on the keys. Wlodarczyk calls it a time machine that takes us back to when the piano was a centerpiece of modern culture. Wlodarczyk is passionate about the MFA’s keyboards, but she believes to really experience them as artworks they need to be played — like visual pieces need to be seen. Instruments coordinator Bobby Giglio says a lot of people ask him and Darcy Kuronen if the instruments need to be played to be kept alive. But every time an instrument is used it degrades a bit. It's the museum’s responsibility to preserve the collection in perpetuity. That said, Giglio understands how the musicians feel, and he added you don't need to be a musician to connect with the instruments. The rare instruments are part of our collective experience, he continued, and every one of them can tell us its own fascinating story — if we choose to listen. The MFA's "Art in Tune" takes place on Thursday, Nov. 29. Other musical demonstrations throughout the museum are listed here.